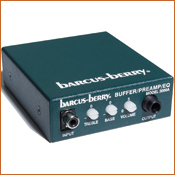 Specifically designed to work with all Barcus-Berry piezo crystal systems. Features external bass, treble and volume frequency controls to allow a wide range of adjustment. Includes a belt clip for unrestricted movement.